Understanding the behavior of nickel nanocrystals at high pressure is the focus of current research by former CDAC student Bin Chen (now at Lawrence Berkeley National Laboratory), CDAC Partner Hans-Rudolf Wenk (UC-Berkeley), CDAC Student Waruntorn Kanitpanyacharoen (UC-Berkeley), CDAC Associate Director Ho-kwang Mao (Carnegie), and colleagues from LBNL, UC-Berkeley, UC–Santa Cruz, and Southern University. Recent findings by this group could help physicists and engineers create stronger, longer-lasting materials, and also help earth scientists understand tectonic events and seismicity. It is believed that permanent changes taking place in metallic grains under pressure are associated with the movement of dislocations. However, the deformation of nanocrystalline materials has been controversial because it was thought that below a certain grain size, these structural irregularities would not form and the deformation would instead be dictated by motions of the boundaries between grains. According to computer analysis, this critical limit would occur in nanocrystals at sizes between 10 and 30 nm. Now, advances in radial diffraction techniques with the diamond anvil cell have allowed measurements on nanomaterials under stress and have paved the way for new types of analyses that will yield detailed information on a wide variety of samples at extreme conditions. Chen and co-workers were able to show that the activities of the structural irregularities that accompany deformation were occurring even in nickel nanocrystals 3 nm in size above 18.5 GPa. 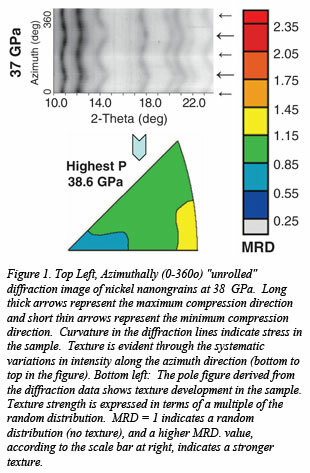 This result demonstrates that so-called dislocation-associated deformation is a function of both pressure and particle size, as previously thought, but that the particle size can be smaller than computer modeling had anticipated. These findings help constrain the fundamental physics of deformation under pressure at the nanoscale and demonstrate the importance of the radial x-ray diffraction technique for investigating these processes. [B. Chen et al., Science 338, 1448-1451 (2012)].